After repeated futile attempts at trying to escape from the perpetually-eleven Pinkie Pie, Rainbow Dash discovers that her pink friend loves to play a good joke and is not quite as annoying as she once thought. The two bond over a pranking spree about Ponyville, but the fun ends when Rainbow’s old griffon friend Gilda comes for a visit and brings with her a more crass interpretation of the word “prank” and a meanie-pants attitude. Pinkie Pie decides to deal with the drama with extreme measures: A PARTY! But can the town’s outpouring of love turn Gilda’s frown upside-down? It is funny, really, to look back on this episode once again after all this time. I didn’t “get” Pinkie until well into Season 2, so episodes like this that were early on in the series and jam-packed full of Pinkie zaniness really grated on my nerves. While I certainly enjoy explosively random energy at times, I also do like to be able to turn it off. However, Pinkie cannot be turned off. Twilight was spared only because Pinkie found a new target (ooh ooh, and did you notice that Twilight was reading the book right-to-left? ), and Rainbow had to concede to “if you can’t beat ’em, join ’em” to catch a break. I really felt for poor Dashie: why won’t this pink plague just go away?! Few things really get to me, but this kind of “always on” personality really did (as well as that of another character who we will meet soon). Not enough to make me want to skip Pinkie-centric episodes or anything, but enough to make me wish that scenes that included her would hurry up and just go away. However, something about her made me want to keep trying to like her, and while in hindsight I can say the struggle was well worth it, boy was it tough for me in the beginning. This seed, planted so early on in the series, embedded itself into my brain and acted as a sort of pressure release valve for Pinkie’s boundless energy. Pinkie’s doing random activity X? Yeah, that’s just Pinkie. It would take more than an entire season’s worth of episodes for that seed to finally (finally) blossom into a true appreciation for Pinkie’s character, and I’m glad it happened. So for anyone who is going through this series for the first time (Noel, I’m eyeing you! 😛 ) and can’t seem to stomach Pinkie, hang with it. She may not become your favorite character, but she will become welcome in your heart. 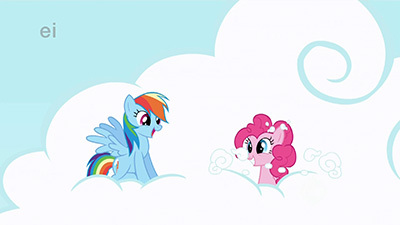 In equally random (and exceptionally tongue-in-cheek) news, Equestria seems to suffer from the same silly problem that America does: it uses both imperial and metric units of measurement, as evidenced by Pinkie’s commands for Rainbow to move a cloud in units of inches and millimeters. And evidently it’s not SI metric either, since she uses “smidgimeters” and Rainbow seems to understand it just fine (even though it’s the last straw). How long is a smidgimeter exactly? The world may never know! 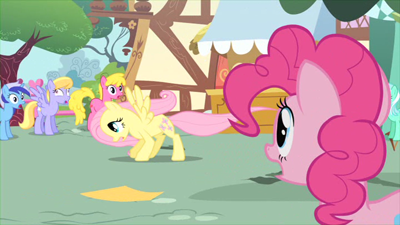 As for actual things that happen in the show: I thought Pinkie’s pranks were rather amusing (especially when Rainbow gives her a taste of her own medicine; Pinkie hiccups are best hiccups), but I do have to give her props for drawing the line at pranking Fluttershy. This being a kid’s show (and, at least in Season 1, an E/I show at that), we get some nuggets of “how to be a decent individual” tossed into from time to time. Some are quite ham-hoofedly jammed in there, but others are subtle and sneak into your mind, only to really reveal themselves later when you sit back and reflect on the episode. 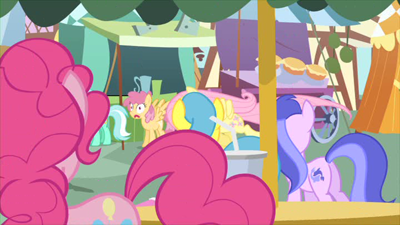 The superficial takeaway to Pinkie and Dash being all hyped up about their next prank but pulling back when they notice who is about to get it is that Fluttershy is just a pony who is scared far too easily (which will show prominently to much amusement in a couple episodes). But the more subtle and thoughtful takeaway is that everyone has limits, some of which may be much lower than your own own, and knowing and respecting those limits is an admirable quality to possess. When was the last time you crossed someone’s limit? When was the last time someone crossed yours? In both cases it probably sucked hard. The point here is that this is the kind of message I’d like the show’s target demographic to be getting, as opposed to, say, the “bullying is funny” message sent by Garfield kicking Odie off the table or shipping Nermal off to Abu Dhabi time and again. Not that there’s anything wrong with this kind of silliness in a cartoon (it’s a cartoon, for crying out loud), but at the same time why not have a kind and meaningful message that children can take away, consciously or not? It’s sort of like how I prefer watching My Little Pony over all the hit new TV shows these days geared toward 30-year-olds like myself that are all about violence and betrayal and drugs and drama and killing: yes I can enjoy those kinds of shows, but why not watch a show that is both enjoyable and also makes me smile and feel good about myself and others? Ah, Gilda. She’s got one of those personality types that drives me batty, though oddly not as much as Pinkie’s did when I first saw this episode back in 2011, and yet I still like her character for some reason. Maybe it’s the neat character model or the fact that I’ve always liked griffons (though I do like “gryphon” better), but for whatever reason she’s a character I wish we got to see more of. Once again, this gaping hole of character potential gets plenty of love in the world of fanon: I’d heartily recommend Dash Academy to any readers who would like to see one (absurdly talented) artist portrays Rainbow Dash and Gilda’s relationships during flight school. We never really do know what happens to Dash and Gilda’s relationship after this episode, but then we don’t always know how our own friends deal with those not in our own circle. And I’m glad the writers left things at that rather than try to tie everything up in a nice bow and make everyone best buds once again. This willingness to leave a few loose ends here and there makes the non-premiere/finale episodes stronger in my books, as it not only paints a more realistic picture of life in Equestria but also of our own. Some conflicts don’t have a clear-cut resolution. Friendship is a very complicated and confusing social construct, and the truth is that sometimes everyone will not get along, no matter how well-intentioned the involved parties (even the cake kind of party!) may be. Good on the town for really trying to make Gilda feel welcome despite her being a jerk, and good on Rainbow Dash for finally acting loyal to her real friends for once. +1 loyalty to you, Dashie, but AJ’s still ahead of ya! For a parting song, take a listen to Pinkie Pie Swear by SoGreatAndPowerful. I still very much consider this a Pinkie Pie episode, and this song is all about Pinkie being random… minus the nerve-grating and physics-smashing. I see what you mean about how this episode can really grate on a Pinkie Pie newcomer. She is relentlessly unwilling to let up or take a hint. Her mind is such that she’ll instantly measure out the lifting power of individual balloons so as to rise her to the level of a cloud just to stay a part of things. When someone says “later”, she doesn’t wait for them, she just waits a bit, then declares it “Later!” and again continues the hunt. And on top of that are the pranks, which go so far as to disrupt public utilities like weather control or dragon breath scroll delivery. 1) She’s not doing this for her own amusement, to laugh at the others, but rather to give them an opportunity to share in the laugh with her. Nothing of lasting harm is done, and often the pranks backfire to hit her as well, but it’s okay because everybody is sharing in the laugh together. It’s simple things like a thunder clap or sneezing powder or invisible ink. Or the painted apples having been done with safe, water soluble paint. Or the final moment where any concern over Celestia having had scrolls dumped on her is resolved by revealing she has her own secreted pot of invisible ink. Pranks are not always a positive thing, and can have damaging consequences. But there are times where it can be safe and bright and give everyone a shared laugh. 2) Fluttershy. Gerf nailed it in that one of Pinkie’s key character moments here is knowing who among her friends should be removed from the target list because they’re the type who won’t be able to handle this well. And it’s never treated as a sneer at or criticism of Fluttershy that she couldn’t handle a prank, but a respectful acknowledgement of where a friend’s limits lie, followed by a reassuring noogie that said friend should stick around for the party to see the bully get some just deserts. 3) I LOVE the reveal that none of the pranks at the party were engineered by Pinkie, but rather Rainbow Dash. It’s such a window into the devious machinations of Mistress of the Shadows Pinkie Pie’s mind, the way she steps back and lets the ultimate prank become the divisive betrayal of friend against friend. And you just know she totally put the idea of a prank party in Rainbow’s head to set this all off. One way or another, Pinkie destroys all threats that come between her sharing laughter with her friends. 4) I’ve known Tessa for years, and Pinkie Pie is the character Tessa has long said she most relates to, and it hasn’t taken long for me to see why. Overall, it’s a fun episode. There’s a nice build establishing the mindset of Pinkie’s pranks, then the dark turn as we see similar tactics now used through the lens of a bully, then the magical turn of pranks pulling down the dark prankster. I actually expected the third act would be an educational PSA about how pranks are bad overall and we should all learn from them, but I’m glad they subverted this expectation by making it more an examination of why pranks are done, and those which are constructive versus those which are destructive. That said, it would have been nice to see Gilda unleashing some of her own pranks at the party, just to see a duel between the styles as one gains support from the group as a whole, the other their disapproval. It’s a minor quibble as the sequence is still well done and earns it all with that final reveal. 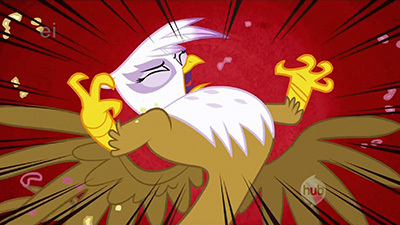 About Gilda, though, I think the show does need to be a little careful in how it handles the non-ponies. We technically have two minorities in this episode, two “races” who stand apart from the largely hoofbred cast, and one is portrayed as a spiteful, antagonistic brute, and the other thoughtlessly wriggles his undressed body up through a cake before anyone else gets to eat any of it. I know this show is about the professed ruling caste of ponydom, but it would be nice getting some more examination of the non-pony folk, a bit more complexity to their portrayals and how they fit into a society where they, while not treated as unequals, are not a part of the ruling ethnic majority. Again, someone is throwing these elements on the table without thinking them through and shrugging it off because, yes, it’s a kids cartoon. To which I’d argue that kids are quick to recognize “the other”, the people who are different from them and stand out from their unformed perception of the norm, and showing them a world of acceptance is good, but showing them a world where the “other” stands out for certain reasons, largely behavioral, that has some issues which need to be discussed. 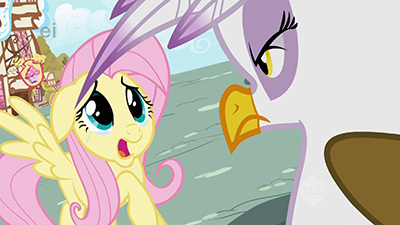 That said, Gilda is a very well designed character, her bullying spree is nicely handled, especially ending on the fear of how easily Fluttershy can be hurt coming to life, and she also brings a nice sliver of history to Rainbow Dash. As we see during the initial pranking bits, Rainbow can get a little caught up in things and doesn’t have the same level of consideration Pinkie does, and Pinkie needs to rein her back during the Fluttershy bit. Revealing this rowdy bully was once one of those friends who used to bring out the worst in Rainbow explains a lot of this, while setting a nice contrast to show that Rainbow has indeed grown and become a better person since those days, even as she has a bit more growing to do. I’m definitely with Gerf in seeing these ponies in their 20s, though I’d still put them in the lower half, approaching the midpoint. The early 20s are an interesting time for people, where some have fully settled into adulthood while others are still growing and learning or just transitioning from college to work or lack thereof, and getting halfway to 30 in that decade is usually a wakeup call that gets people to evaluate where they’re going. Some of our ponies will be fine and are set, some still have a ways to go. Rainbow is one of those, still harboring her adolescent dreams of joining a star racing team and treating her weather management job as less a career and more a placeholder stepping stone she’ll use to get along until her time comes. And Pinkie is fully settled, with a successful bakery and social group, but she still has that youthful spirit and likes to zap others into remembering their own. I have to wonder if this is why so much of the fandom for the show are people 20 and over, peers either in the midst of these life moments, or those recently through them who are still reflecting back, and that their attachment is because, instead of it being all about those choices and struggles, it’s about letting that slip into the background and focusing on moments of surprise and delight and bonding with friends. We’ve left behind so many of our childhood friends, most of the people we knew in high school, a good chunk of who we went to college with, and now we’re trying to settle into adult life, holding onto the few (if any) bonds which have carried on through those years, while still forging new ones we hope might finally last. It’s a surprising direction for this show to have taken, but I think I’m finally coming around to understanding and appreciating it. I was worried for a moment that I would have to rush to Best Pony‘s defense on this one, but Noel nailed a lot of what I would have said to back her up. This is arguably our first Pinkie-centric episode, and while it’s not anywhere close to my favorite of hers (actually it’s probably my least favorite of the episodes that revolve around her), a lot of what I love about her still shines through in this one. Probably my favorite bit of this episode is her chasing down Rainbow Dash, calmly bouncing along behind her and yet somehow beating the fastest pony in Ponyville (at least when in the sky) to her hiding place every time. It’s one of those cases in which Pinkie seems to very much be the only character to realize she’s in a cartoon and taking full advantage of it. On a slightly more Fridge Horror note that may or may not come up again down the road, this scene lays out the idea that it’s practically impossible to escape Pinkie Pie if she’s dead set on finding you. Fortunately, she’s the type of pony who at worst is hunting you down to drag you off to a party or explode with excited energy at you. Usually. I also really like that they go out of their way to clarify Pinkie’s approach to pranking, and how it differs from Gilda’s (and even a bit from Rainbow Dash’s). She’s not doing it solely for her own enjoyment, but rather out of a desire to make all parties involved laugh. She takes a few up to the edge of amusement for the ponies on the receiving end, but stops shy (no pun intended) of pulling jokes when it’s clear the pony on the receiving end won’t take it well. Pinkie and Fluttershy’s moments in this episode are another highlight for me, between Pinkie’s clear concern for her slamming the brakes on a prank-in-progress and Gilda’s bullying of her being Pinkie’s final straw, as well as Pinkie’s reassuring towards Flutters being met with an adorable reveal that Fluttershy is older by a year. No, that’s totally not because I have my shipping goggles out and ready for next episode and they just happened to catch my second favorite pairing in this one. No, I’m not going to jump on every little moment between these two that I can potentially blow way our of proportion down the road. No, I didn’t just reveal myself to be an unrepentant pony shipper. …those were convincing statements, right? It’s also true that the handling of non-pony characters sort of teeters on the edge of being a bit problematic at times, although I do like that Pinkie very clearly makes the distinction that Gilda is simply a bad egg and isn’t representative of griffons as a whole. At least as of Season 4, however, it seems fairly set in stone that Equestria is overwhelmingly populated by ponies (in the three flavors they come in), with non-pony races being exceedingly rare. If I may look quite a bit forward to do some baseless speculation here, griffons will show up here and there down the road, and quite possibly have a decent sized population in some part of Equestria (they’re represented in the Equestrian Games), but I’d guess they’re somewhere towards the outer borders of the nation with possibly a much higher concentration outside of Equestria. Donkeys make a few appearances, but they don’t appear to have representation in the Games, suggesting there’s probably not a high enough population in any one place in Equestria and are likely by and large foreign. Dragons definitely have a presence, but they very much have their own thing going on (Spike is, by all appearances, a one-of-a-kind example and not at all the norm, despite that bringing up some questions down the road). Bison, similarly, have a definite presence, but they also have their own separate culture and society, and don’t seem to cross paths with ponydom very often (we’ll only ever see one example of the two clashing). As of the most recent episodes we’ve still only seen one zebra and similarly one minotaur, so we can probably assume they both typically hail from outside the nation. Goats have also only shown up once along with said minotaur, and so we can possibly assume they come from the same place. I dunno what my actual point with any of that was, other than I guess that outside of the realm of typical furry confusion with critters and pets (cows and sheep landing somewhere really confusing in the middle of the whole thing), non-ponies are few and far between in the series. It’s not particularly far-fetched that Pinkie might not have ever seen a griffon before, since she probably hasn’t strayed far from Ponyville prior to this point. I haven’t said a ton regarding Gilda in this write-up, and it’s because to be completely honest, I’m not particularly fond of her. It’s nothing against the creation or execution of the character, rather I think it’s more that I’ve known several Gildas in my lifetime, particularly in my Middle and High School years, and never had much of a pleasant experience with the personality type. I do like that she winds up orchestrating her own downfall, and that Pinkie edges just around the point where she can still claim plausible deniability (her utter shut downs of Gilda’s attempts to be intimidating during the party are fantastic). We don’t know for a fact that she egged Dashie on to set up the dominoes for Gilda to knock over, but she seems to know just a little too much about what’s coming (while it is just a sight gag, she does have marshmallows on hand and ready to roast when Gilda trips up the first of Rainbow Dash’s pranks, and she clearly was expecting pranks to be present throughout the party) for me to buy her complete show of innocence. If true, this is one of the first real glimpses into the fact that behind the silly songs, goofy non-sequiters, and seemingly random wacky thought patterns, Pinkie is quite a bit smarter than others possibly give her credit for, and usually knows exactly what she’s doing. On a final unimportant but potentially interesting note, it might be worth bringing up now that the episodes in this first season are slightly shuffled chronologically speaking. By and large the continuity is simplistic enough at this point that the out-of-order episodes don’t particularly matter and it never becomes too confusing (outside of things like one episode taking place at the end of winter and two episodes later jumping backwards to the beginning of fall), and it’s something that stops happening entirely after this season, as “seasonally appropriate” episodes from the second season on are aired more or less in line with the time of year they release. The reason I even bring this up is that a few people have noted that Pinkie’s recounting of Rainbow Dash’s heroics to Twilight at the beginning of this episode match up fairly well with the climax to an episode we’ve yet to see. There’s never been any confirmation one way or the other as far as I’m aware, and her story is vague enough that it could well just be coincidence, but it’s still interesting to think about. On one more for-realsies unimportant final note, I somehow never noticed these two prior to this most recent watching.